Welcome to NY CPR SERVICES! The American Heart Association's mission is to reduce disability and death from cardiovascular disease and stroke. It has a 20/20 goal: to improve cardiovascular health by 20% by the year 2020 while reducing deaths from cardiovascular disease and stroke by 20%. Almost 80% of all heart attacks are witnessed by a family member or a friend. The chance of survival doubles if the witness is trained in CPR. The victim of an emergency, such as a heart attack, cardiac arrest, stroke, or choking, may be saved if the people on the scene, LIKE YOURSELF, take immediate action! Our classes are all authorized by the American Heart Association, and certification is valid for two years . 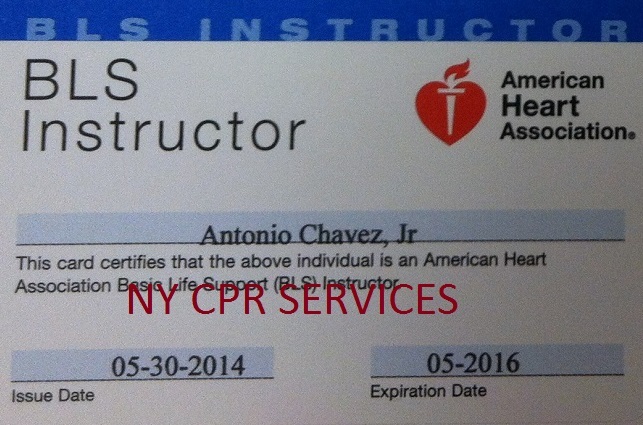 New York CPR Services offers several levels of CPR training, depending upon your needs. We provide CPR and AED training to individuals who need certification and re-certification such as Doctors, Nurses, Dentists, Security Guards, Teachers, Personal Trainers, Nannies, Babysitters, etc. We also service groups such as Daycares, Nurseries, Nanny groups, Summer Camps, Schools, Churches, Health Clubs and Businesses within the New York City Area (Manhattan, Bronx, Queens, Brooklyn), Yonkers, Long Island, Westchester, Rockland, Hudson Valley area, New Jersey and Connecticut. We are also a NYC Department of Education Vendor. Vendor #ANT008532. Basic Life Support training or regular CPR training has traditionally been frightening, stressful, and sometimes boring. We use low stress techniques and a lot of hands-on practice that promote confidence and retention. Our training can be tailor-made to meet the needs of specific groups and/or individuals. Whether you're a member of a community who wants to know how to help in an emergency, need a private class, have a defined duty to act in emergencies, looking to train your employees, or need to be re-certified, we will have a program for you and will have a class that best fits your schedule. Our desire is to ensure that quality CPR lessons are given in every class. We make sure that each student leaves the classroom feeling a sense of ownership over the skills they gained. Our goal is to help you learn and retain the AHA information provided. We will help you succeed! We can also create last minute classes if you need them. So if you needed your certification �YESTERDAY�, we can accommodate you with a private one-on-one class if none of our scheduled classes fit your time schedule. Find out more about what we can do for you. We Provide the AHA Basic Life Support(BLS) for Healthcare Providers Skills Check for Students who have successfully completed the AHA BLS Online Renewal Course (part 1) and having acquired the appropriate certificate. Upon presentation of the online certificate and successful completion of the Skills Check the student will receive their HCP certification card. Please call or E-mail to schedule an appointment. IF YOU DO NOT SEE A TIME APPROPRIATE FOR YOUR NEEDS, PLEASE CALL (914) 523-5326 (PLEASE NOTE MY OLD NUMBER (914)263-9754 was hacked) to schedule a special time for you. PLEASE NOTE: EVERYONE WHO TAKES ANY CLASS AND PASS THE COURSE WILL RECEIVE A CERTIFIED AHA CARDS AT THE VERY END OF CLASS. NO WAITING IN THE MAIL!! SO IF YOU NEED A CARD ASAP, THIS IS THE CLASS FOR YOU!